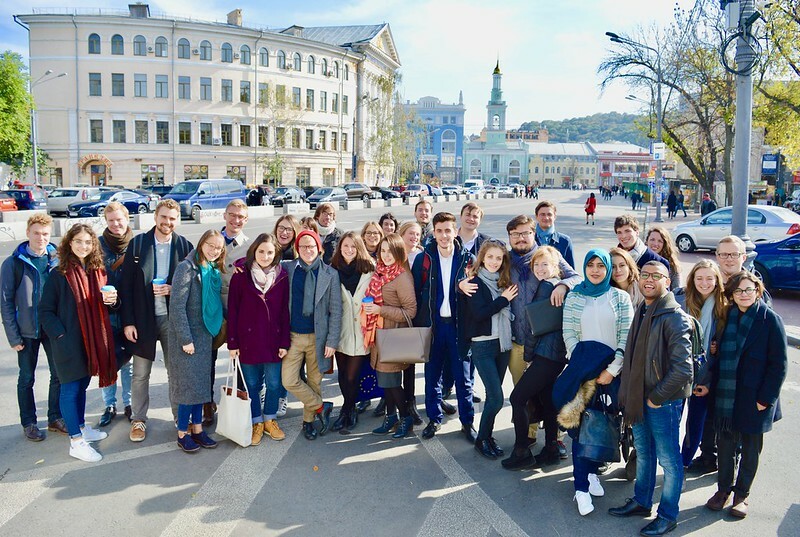 From Sunday, 1 October to Friday, 6 October 2017, the students of the Natolin campus of the College of Europe took part in a study trip to Kyiv and Lviv (Ukraine). Study trips have always been an integral part of the academic programme at Natolin. They not only provide students with the opportunity to learn about crucial socio-political issues in carefully selected destination countries, but also give them insight into their history and culture and are essential in forging collegial bonds and an esprit de corps among students. Ukraine is an ideal destination in order to pursue the above-mentioned goals: it is the largest country of the European Union’s Eastern Partnership and it is a state which faces the unique challenge of achieving a successful transition, while simultaneously embroiled in a military conflict. Moreover, it is fascinating from a cultural and historical standpoint: the richness of Ukrainian historical and cultural heritage, its active civil society, and its cultural and geographic location in Central Europe all make it a particularly interesting case study for Natolin students. The College of Europe's contacts in Ukraine and the region, in particular thanks to the invaluable network of the European Neighbourhood Policy and European History and Civilization Chairs, allowed students the opportunity to meet with vital opinion-makers, such as politicians, government officials, diplomats, scholars, journalists, and civil society activists. On site, the academic programme was structured around four broad themes: Security, Civil Society, Internal reforms, and History and Memory. Finally, students had the opportunity to meet College of Europe alumni in Kyiv and learn about Ukraine's unique cultural heritage in Kyiv and Lviv. Regular updates on the study trip were published on Natolin's Facebook and Twitter pages.